Metal Beam Crash barriers are basically Road safety system which prevents vehicles from colliding with obstacles.Metal Beam barriers are used to prevent the major risk of accidents and vehicle collision. The range finds wide application in hilly areas, highways, U-turns and roads. The range saves one from the risks like crossing the median on hilly roads and colliding head on with other vehicles, falling down the embankments, colliding at sharp curves. 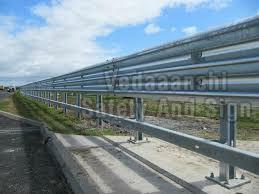 Highway Crash Barriers helps in redirecting the vehicles far away from the strong energy of the errant vehicle.